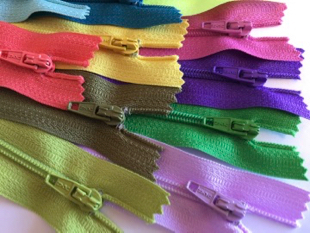 Selection of fun colors for little pouches, bags, crafts. #3 coil zippers: small, strong, & flexible. 14" finished, closed bottom zippers. Videos on my Facebook Page on how to make little triangle bags. More patterns & videos coming soon.